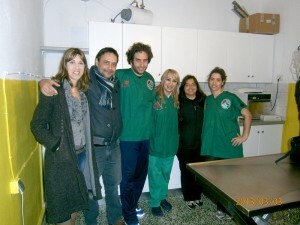 Three vets from EDKE, Voluntary Action of Veterinarians Greece, came for a second time to Amorgos. During the weekend of March 2nd and 3rd, with their invaluable help, 45 cats and 2 dogs were spayed/neutered. All cats were given a thorough health exam and dewormed. The two dogs also received microchips and were vaccinated for rabies. Because of them and their efforts, the weekend was a great success. Thank you to Drs. Angeliki Degkleri, Themistoclis Michael, Attalidou Pigi as well as to Dr. Maria Despoti.